Another Great Friday with Unity Flair with Friends! Happy Friday! It has been a crazy week which is the main reason I haven't been able to post. I have had something to do after work every day. I was happy to come home and see the my new order arrived! Super excited actually because the one weekend only sets were in that box! I decided to have a go at them for my Unity Friends Flair! ! ! Here we have my first card. I used SU ribbon and paper and Basic Grey Lime Rickey DP. I of course used Unity stamps. 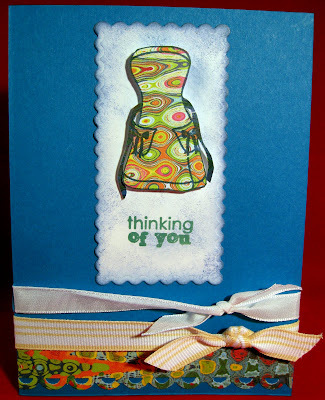 This cute little apron is from the new Kitchen Logic set. I picked out the "thinking of you" from another Unity set. My 2nd card is K & Co. Paper which I love along with some cream and kraft from SU (the ribbon is SU too). 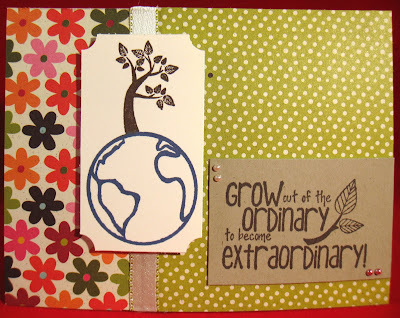 I used my new chalk inks on this WONDERFUL new Grow yourself Extraordinary. Well it's late and I have school in the morning. I hope you like my cards. I'm pretty happy how they came out.